The first Australians understood that this continent has more than four seasons. Acutely observed, the Daylesford Nature Diary reintroduces the six seasons for Victoria’s southern foothill forests in all their splendour. 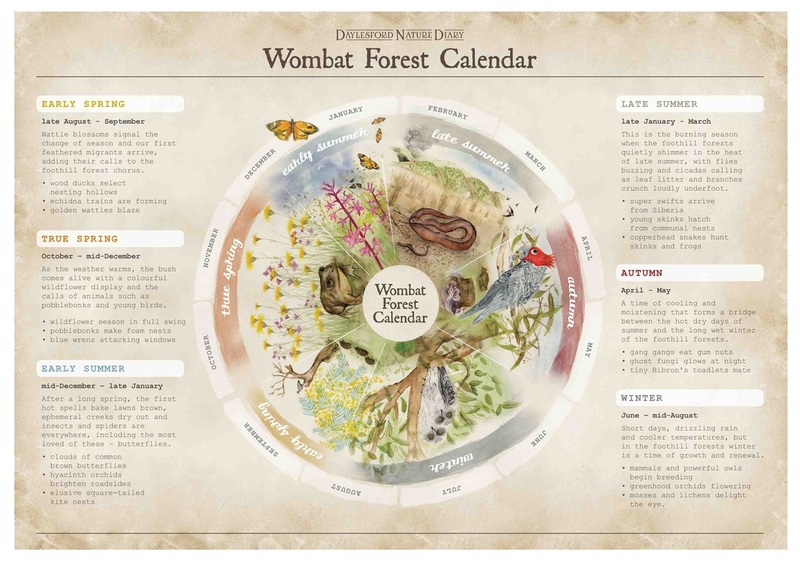 It includes a full colour, beautifully illustrated wheel calendar of wall poster size as a reference and guide. A Daylesford naturalist and local newspaper columnist, author Tanya Loos lovingly illuminates the world within and around a Wombat Forest bush block – from that mysterious bonking at the bottom of the garden to why there are suddenly so many green parrots in late summer. Part What Bird Is That?, part Rudyard Kipling’s Just So Stories, the 36 tales of nature contained in the Daylesford Nature Diary are insightful in the knowledge they impart, while whimsical in tone. Starting with early spring and heading round to winter, Tanya provides a series of sketches of the birds, plants and animals putting in an appearance each season. Not simply the rare and endangered, but those you might commonly expect to catch sight of from the back door. Gently threading her way, Tanya instructs us on how the natural order of things is attuned to the rhythm of the six indigenous seasons. Life beats to their pulse. RRP $29.99 Purchase via SHOP ONLINE on the em PRESS website or at selected bookshops. Alan Reid, OAM, environmental educator and author of Banksias & Bilbies. Roger Thomas, Nature Notes, Ballarat Courier.
" [T]here is much to recommend in this charming and well-written book. The author takes an innovative approach and lays the chapters out according to the seasons of the local Indigenous peoples. The resulting accounts contextualise the wildlife in both space and time that harks back to such seminal natural history classics as eighteenth century naturalist Gilbert White's The Natural History of Selborne." Review in Australian Birdlife magazine. December 2013. Tanya Loos is a biodiversity consultant who lives on a bush block near Daylesford, central Victoria. Since moving to the region in 2000, Tanya has kept nature journals, written a monthly nature column for the Advocate newspaper, and developed a seasonal calendar for the Daylesford region. Tanya has a degree in ornithology and is a former President of the Ballarat Branch of BirdLife Australia. She led bird surveys for three years monitoring biodiversity take-up at Ballarat Region Treegrower's biorich plantation at Lal Lal. She was the ornithologist for the Castlemaine landscape restoration project, Connecting Country.